The identity change includes both HDMA and its research foundation, the Center for Healthcare Supply Chain Research. COLORADO SPRINGS, Colo. — The Healthcare Distribution Management Association (HDMA) has changed its name to the Healthcare Distribution Alliance (HDA). John Gray, president and chief executive officer of HDA, which represents the nation’s primary pharmaceutical distributors, announced the organization’s new identity on Monday at its 2016 Business and Leadership Conference in Colorado Springs. With the name change, the group’s nonprofit charitable research foundation, the Center for Healthcare Supply Chain Research, will now be called the HDA Research Foundation. Gray noted that the recent implementation of the Drug Supply Chain Security Act (DSCSA), enacted in November 2013, and approval of the Ensuring Patient Access and Effective Drug Enforcement Act of 2016 (S. 483), which President Barack Obama signed in April, paved the way for the organization to adopt a new name. 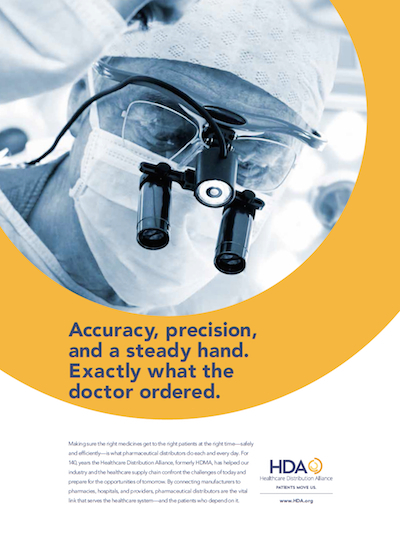 HDA is promoting its new name in an advertising campaign in the policy and politics journal Politico. HDA also is announcing its new name in a print and digital advertising campaign running June 13 to 17 in the health care verticals of the politics and policy journal Politico. The organization said it enlisted GMMB, a Washington, D.C.-based communications firm, to develop and launch the updated brand and to create the advertising. The group’s website is now HDA.org, and its new Twitter handle is @HDAConnect. The new website for the research foundation is HDAFoundation.org. Since its founding 140 years ago, the organization has changed its name three times. The group was founded as the Western Wholesale Druggists’ Association (WWDA) in March 1876 in Indianapolis. It became the National Wholesale Druggists’ Association in 1882 and then HDMA in 2001. The HDA Research Foundation was originally founded as the NWDA Research and Education Foundation in 1980. In announcing the new name at the conference, Gray gave a presentation that walked the audience through the organization’s long history. “Throughout HDA’s 140-year history, the health care distribution industry has been called upon to adapt and lead through periods of change. In these times we have actively engaged with our supply chain partners to achieve our goals. The word ‘Alliance,’ in particular, better reflects our role as a convener of the supply chain — in the United States and now abroad — with the vision and persistence to successfully navigate these changes,” Gray said. “Further, our position at the center of the health care supply chain allows us to forge key partnerships for the benefit of our ultimate customer: the patient, which is reflected in our new tagline, ‘Patients Move Us.’ While distributors often do not come into direct contact with patients, we recognize that our industry and the supply chain would not exist if patients did not rely on, and benefit from, our services and expertise,” he added. Arlington, Va.-based HDA represents 34 distribution companies — including national, regional and specialty distributors — as well as more than 145 manufacturer and 50 service provider/international members, which serve over 200,000 health care providers.